Let us know of any Russian events for children and we'll list them here! Sainted Media have produced a range of materials for children on St. Andrew, patron saint of Scotland, Russia, Greece and Romania (and other places!). You can listen to a free audio recording on St Andrew in Russian by clicking on the image to the left - or here. Other languages are available on www.saintedmedia.com. Sainted Media's St Andrew e-book is available on ITunes (free) and Amazon Kindle in Russian, Spanish, Gaelic and English - details on those and other Sainted Media publications on www.saintedmedia.com. Early Start Russian from Early Start Languages Ltd. is a short course for primary / early secondary students which can be taught by non-specialists. The course is available online or on disc and includes films, e-flashcards, songs and teacher support materials. Vivid HD films show Russian language and culture seen through the eyes of Russian children living in the UK. Your pupils will learn as they see and hear everyday natural language. Russian with the Smeshariki from the Pushkin Instiute in Moscow. 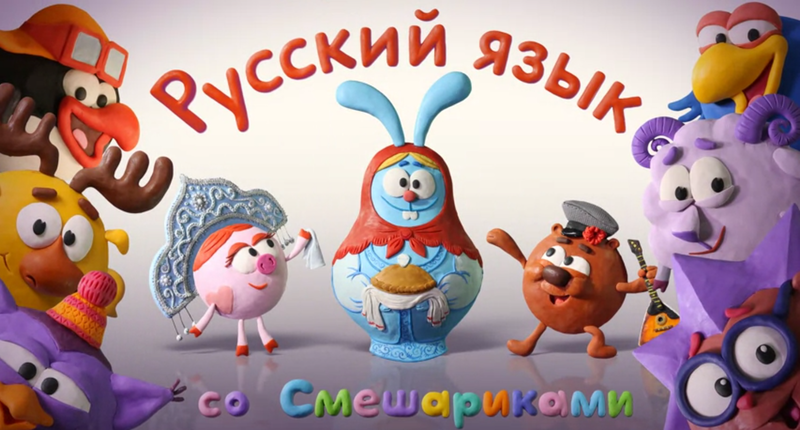 The Smeshariki are characters in popular cartoons for young children (Kikoriki in the English language version on YouTube) and have been used in a series of attractive Russian language films for children learning Russian. and try the language pages on this site too of course! A great CBeebies series on the BBC , Where in the World? shows the everyday life of children in different countries - including Liza in Russia. Check the BBC website for dates and Iplayer availability. Look East - a workshop for teachers. This was the programme in Glasgow, Sept 2017. We hope to be running more workshops in other parts of Scotland - contact us for more information. How can you introduce Russian and East European culture and language to your pupils? A workshop for schools. Relevant to teachers of 1+2 courses in primary schools and secondary school BGE, Modern Studies qualifications, and Languages for Life and Work qualifications. Glasgow University Russian Department celebrates its 100th anniversary in September 2017. The department has developed in those 100 years, not least being joined by teachers of other East European languages and cultures – currently Polish, Czech and Hungarian. They would like to invite schools to discuss how to work together to ensure that pupils have an understanding of the rich cultures of that part of the world, situated between the more familiar countries of Western Europe and the Asian countries we are starting to learn more about. As you prepare to celebrate European Day of Languages on 26 September don’t forget that Europe stretches as far as the Urals. Tasters will give you a feel for some of the languages and cultures of Eastern Europe. We’ll start with Russian, Polish, Czech, and Hungarian – but let us know which other countries are of interest to your pupils. Are there any suitable learning materials available? How could these languages be fitted into the 1+2 framework? Is Eastern Europe relevant to other topics your pupils study? 9.00-9.30 Registration, coffee, networking, exhibition of teaching materials. Please bring your own materials and ideas to share. 9.30-9.45 Welcome by GU/SRF. Why should Eastern Europe be on the syllabus? 11.15-11.45 Where do we go next? Open discussion. How can you include Eastern Europe in your teaching? How can the university and other specialists help? What materials / training would you like? The workshop is free but registration is essential. Jointly organised by Glasgow University and the Scotland-Russia Forum with support from Glasgow City Council.